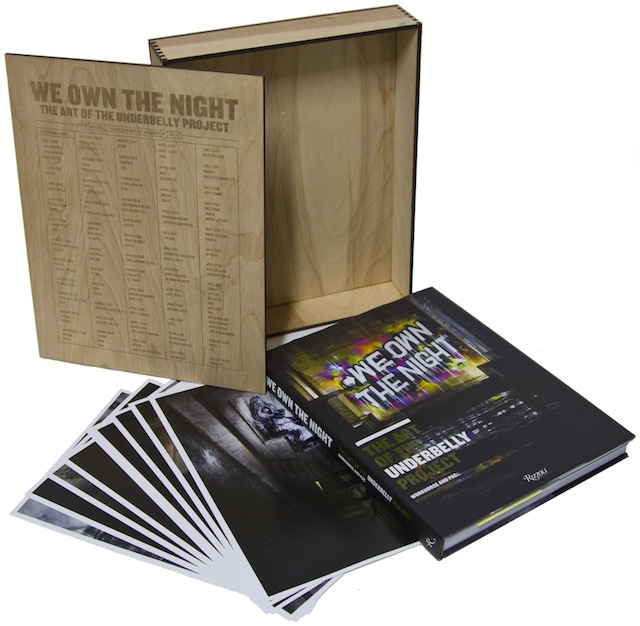 Our friends over at Vandalog have announced the exclusive online sale of We Own the Night: The Art of The Underbelly Project through their online shop. Originally sold at The Underbelly Project Show at the recent Miami Art Basel, the remaining collector’s editions will be sold online for the first time exclusively through Vandalog. The We Own the Night: The Art of The Underbelly Project collector’s edition package includes a hard cover book along with 9 unreleased photos packaged in a handcrafted oak box engraved with the names of each artist that contributed to the project. Each box is laser engraved with the individual number from the edition of only 100 plus 10 artist’s proofs. The photographic prints include depictions of work by Roa, Anthony Lister, Skullphone, Kid Zoom, Revok, Ceaze, Jeff Soto and more. The package is priced at $250 plus shipping and handling and is available now on Vandalog.